Many customer wonder why hydrostatic level sensors fail due to lightning strikes, even if they ordered a level sensor with integrated lightning protection. Understanding how the lightning protection works and how lightning strikes affect hydrostatic level sensors is important in resolving this confusion. When submersible pressure sensors, a special type of hydrostatic level sensors, were first installed into reservoirs and lakes to monitor level, the sensor would become burned or destroyed after a lightning storm or bad weather periods. This prompted much research into the effect of lightning storms on the instrumentation in reservoirs and the cabling to and from the site. The first thing to understand is that the effect of a lightning strike is considerably different depending on how close to the pressure sensor the lightning strikes into the ground or installation. It is fair to say that no level sensor will survive a direct or very close nearby lightning strike, where often the whole cabin including all installed electronics will be incinerated by direct hits. However, more distant hits will only raise the Voltage differential by for example 1500 Volts. 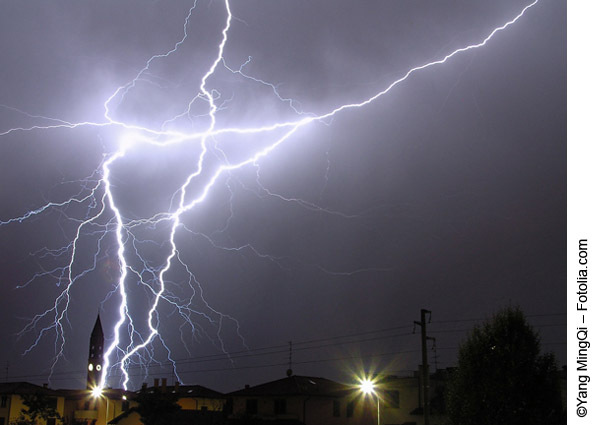 If a local lightning strike raises the electric potential of a reservoir, the level sensor may provide the shortest way for the raised voltage and current to earth. The energy will then dissipate into the ground via the level probe and thus destroy or damage its electronics. This may equally be the case when overhead wires take a hit. How does lightning protection in level sensors work? However, sensors can be protected from these lightning strikes by installing or integrating a transient voltage protection into the hydrostatic level sensor. Due to the short nature of the voltage pulse, a component may be fitted to or integrated into the sensor that acts on rising differences in voltage potential. If the voltage goes above say 50 Volts, this lightning protection can short-circuit the electronic circuit to ground, allowing a path to ground for the surge and protecting the electronics up to the maximum specified voltage potential. The component would normally operate in a non-conductive state, but will be conductive for a voltage transient, allowing the voltage spike to flow harmlessly to ground. If the connection to earth is not good enough or no lightning protection is integrated within the hydrostatic level sensor, then the electronics will take the full amount of energy of the voltage pulse and fail.Therefore the protection is only as good as the earth grounding provided by the user. In outdoor applications, where submersible pressure transmitters are commonly used, WIKA offers an optionally integrated lightning protection inside the level sensors. The sensor electronics will then be protected from local power surges and transient high voltage. Lightning protection is a combination of protection within the instrument and a good low impedance earth grounding. Have a look at the profiles of WIKAs submersible pressure transmitters LH-20 and LH-10.